Paper published in the BMJ Open  evaluates the annual NHS cost of managing wounds and associated co-morbidities as £5.3billion– comparable to cost of obesity . I find this a surprising even staggering statistic. 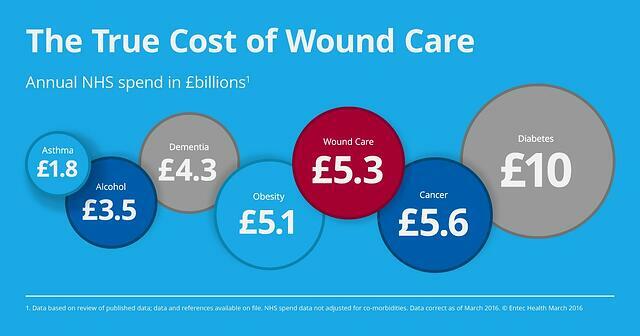 This has not been on my radar before and I am wondering how may NHS CEOs, CCG Commissioners, Finance Directors, LA Commissioners, clinical leaders and service managers have a grasp of the true cost of wound care? If this was a paper on obesity, diabetes or mental health, I wonder if its eye-opening findings would have been so hidden from the mainstream view? So why is wound care so often the overlooked, day-to-day service of the NHS? As a nurse-led service, the care of patients is predominantly managed within the community. Is the lack of visibility therefore as a result of wound care not being physically represented in its true volume as a full waiting room or secondary care waiting list? 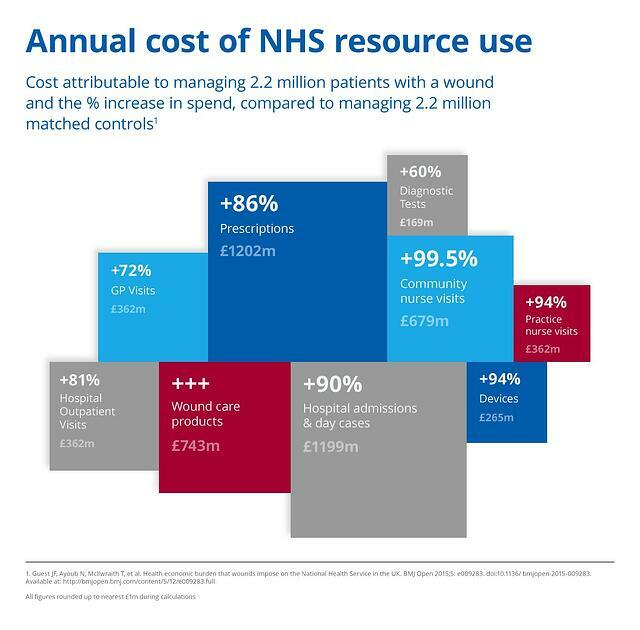 Eye-watering cost to health care of managing wounds and associated co-morbidities at £5.30 billion per annum, which when adjusted for comorbidities still runs at £5.1 to £4.5 billion. So does this article cover the full cost of wound care? The paper by Guest at al  takes into account the cost of health professionals’ time and prescribed products, but does not include social care costs (additional support at home, home adaptations, equipment and admissions to long term care). The paper cites “Also excluded were the costs incurred by patients taking time off work. However, patients’ mean age was >65years, so it is unlikely that many were in employment”. I would add to this – their family are likely to be in employment, and equally likely to be taking time off work to attend clinic appointments with patients and provide unpaid care. How many will have had to give up work entirely in order to provide full-time care? “Invisible” patients lost in the system? Posnett et al  concluded in 2008 that 400,000 new pressure ulcers were occurring in the UK each year, whereas Guest et al cite a prevalence of 153,000. This is a vast difference that Guest postulates could be accounted for by management in care and nursing homes – care predominantly provided by private providers on behalf of local authorities, leaving both open to additional management costs and risk of litigation. Pressure ulcers as an example, are seen as avoidable, although frequently an outcome of medical care. Prevention of pressure ulcers is a key focus and rightly so. However, there is ample opportunity to also improve outcomes for those individuals already suffering from these painful and life-impairing wounds. A recent request to the NHS Litigation Authority under Freedom of Information  has identified the cost of claims for clinical negligence associated with pressure sores from April 2010 to April 2015 is just under £19 million, with the cost of claims in the 2014/15 tax year alone exceeding £7.1 million for 172 successful claims. Each of these claims represents an individual person whose life has been blighted, distraught families, friends and loss of life quality. No matter what we say about today’s litigious society, the decision to take legal action, with the time and stress involved is not an easy one. Imagine feeling aggrieved enough to sue on behalf of yourself or your loved one. Surely if curative actions were taken promptly, effectively, and accountably, the psychological impact of the injury could be reduced and we would hope the healing time improved. What about the cost to social care? Criteria for council funded admission for long-term care is stringent, these people already require a high level of support, add a poorly managed leg ulcer or pressure ulcer and mobility is further impacted, making the complexity and cost of management far higher. How can we assess if money is being spent effectively on treatment? Wound care forms part of community care provision, predominantly through district and community nursing. The major concern over this state of affairs is that money is pouring into the service (whether sufficiently or not is another subject), without accurate outcome measurements to demonstrate if the spend, or any particular treatment is effective. Without robust, documented evidence of outcomes achieved, there is a continued risk of lack of transparency on quality of care, cost-effectiveness and opportunities for continuous improvement. There is an obvious duty of care to establish accountable care where each Trust/Service Provider can be confident that staff actions are effective and delivering the best possible care to patients. With clearer and mandatory reporting of wound outcomes we could avoid wasting time, effort and money on ineffective and often expensive treatment regimes. We can look to a future where the NHS stops relying on activity as a measurement of treatment and starts monitoring wound outcomes as a measure of effectiveness. The key gap in wound care seems to be availability of robust wound informatics to monitor, document and report wound outcomes at a patient and patient-population level. Accurate wound measurement, photographs and data sharing across the health economy allows for more objective management, holistic treatments, swifter interventions when regimens are ineffective and clearer visibility of the use of overstretched resources. This would also mean that the cost of time invested can be evaluated, as each wound care action and outcome is recorded, and the whole system becomes fully accountable. Digital solutions for wound assessment are now emerging to enable capture of wound outcomes data to support improved clinical management of patients. The NHS has an opportunity to upgrade it’s approach to delivering accountable, cost-effective care to patients who deserve optimal outcomes when suffering with chronic, complex or acute wounds.